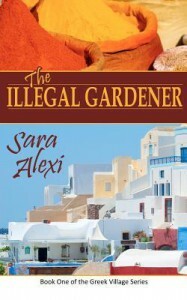 Sara Alexi weaves an entrancing story of the burgeoning relationship that develops between two people from very different backgrounds and cultures, an English woman living in Greece and the Pakistani illegal immigrant who becomes her gardener and house boy. Each comes with their own problems, their own past baggage, and she explores these with sympathy and understanding as well as the many nuances of the differences in cultures as they become more and more dependent on each other. I'm not sure what compelled me to read this novel. While the premise is somewhat interesting (and hints at something possibly steamy) it's not exactly the kind of novel I rush out to read. But it was cheap and sounded somewhat promising so I bought it. It was a good novel. Not anything tremendous. Not good enough to warrant reading follow up novels, but good in that it mostly held my interest. That I didn't hate the characters. It even warranted a vocal sigh when I reached the end, a sigh of contentment that the story ended on a high note. The Illegal Gardener was heavy on the characterizations...which I do enjoy. I like learning about characters, and their psyches...even if they are entirely made up characters...but in this case I felt a teeny bit cheated out on more descriptions of the setting. I mean, if the setting wasn't important, this book could have just as easily took place nondescript location...but it takes place in Greece and that fact does play a pivitol role...but there is a disappointing lack of descriptions. I never really managed to get a sense of where the characters were. I don't need a repeat of Correlli's Mandolin...but still, I would have loved to get a sense of the country...a country I've never visited, but have read a fair bit about, thanks to a lit class I took back in college. Still, the characters did make up for the lack of setting description...enough so that when I heard about the siege at one of Pakistan's airports, I felt an odd sense of sadness that was no doubt remnets of my time spent with Aaman.